Shop the Tear Em Up Store Now! I started fishing when I was 3 or 4 or really for as long as I can remember. As a kid, our summer vacations were spent at Beaver Lake – fishing and camping. Anyone that fishes knows the standard answer when asked about how is the fishing today? Tear em up fishing is dedicated to the good old days when fishing was passed down through families and with your buddies. In 2014, I discovered kayaking and my whole world changed. 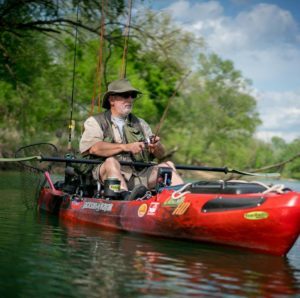 I was opened up to a new realm of recreation and I was hooked the first time I got in a kayak. Going to big box stores and looking at the different apparel available in mass merchandising, I wanted a tear em up line designed for the average fisherman. Something comfortable, functional and affordable. Good Luck and… Tear Em Up!